Earn up to 3,512 reward points. High power output, light and easy to use. The XLS Series has been a popular sound reinforcement solution since its introduction. It is aimed at the working musician who needs reliability, affordability and quality in a power amplifier. The XLS1502 is part of the latest generation of XLS amplifiers, and it offers unprecedented control, efficiency and usability. It features a sleek new look, an LCD display that is three times larger, and more DSP with higher capabilities. Like its predecessor, the new XLS1502 is ultra-efficient with Crown' patented DriveCore technology and can drive 1550W at 4Î bridged with plenty of headroom, guaranteeing a clean, undistorted signal straight to your speakers. The XLS DriveCore 2 assures that you will be heard as you deliver a powerful, pure sound experience for any venue. 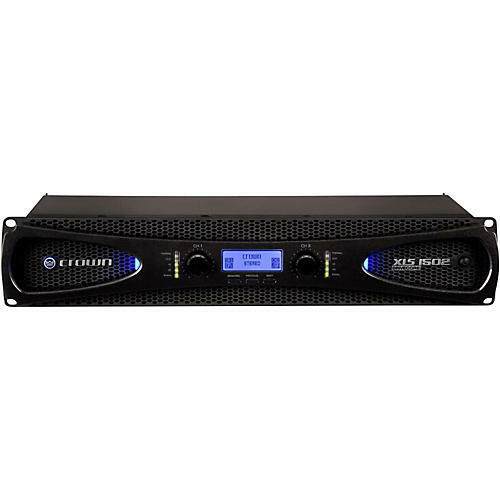 Order today and bring Crown quality and reliability into your PA system.